When you're looking for attention-grabbing thighs, don't neglect the back view. The hamstrings in the back of your thighs aren't as easy to target as other muscles in your legs, but different types of leg curls help whip your hamstrings into shape. The curl move is similar in all variations, but the different body positions make slight changes to the way your hamstring muscles work. These curls are handy because you don't need to go to a gym. 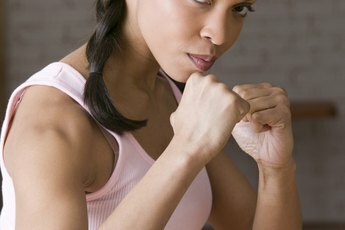 All you need are some resistance bands and something sturdy to clip them to, such as a closed door. Connect one end of the band to the door and the other to one ankle while you're facing the door. Step back until the band is pulled taut. Lift the leg back, squeezing your hamstrings at the top of the move. Do two sets of 10 repetitions. Although you might feel a bit awkward when you first try this exercise, this one can be done in the privacy of your living room while you watch television. 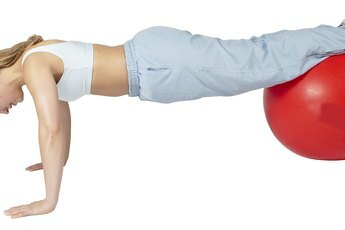 Lie on your back and place your heels on top of a stability ball, also called an exercise ball. Keep your body in straight line from your shoulders to your ankles, which means only your head and shoulders should be on the floor. Bend your knees to roll the ball back toward your hips, lifting your hips as the ball gets closer. To make it harder, use one leg at a time on top of the ball. When you hit the gym, head for the seated leg curl machine. This machine has an inclined seat with a back, handles beside the seat, a padded knee rest and a padded ankle bar that starts out straight in front of the machine. Put your knees over the knee rest and place your ankles in front of the bar -- some machines have two bars to slide your ankles between. Lower your ankles, pulling your heels toward your bum. Hold onto the handles to help you keep your hips on the seat. Don't let the look of the lying leg curl machine scare you. Yes, your rear will be up in the air for all to see, but the inverted "V" shape of the machine is ideal for targeting your hamstrings. Lie on the machine and hold the handles near your head. Hook your ankles behind the padded bar and lift back through your heels, squeezing the back of your thighs. This reverse motion lets you work against gravity as well as the weights as you lift. Do Dumbbell Lunges Work Your Hamstrings?